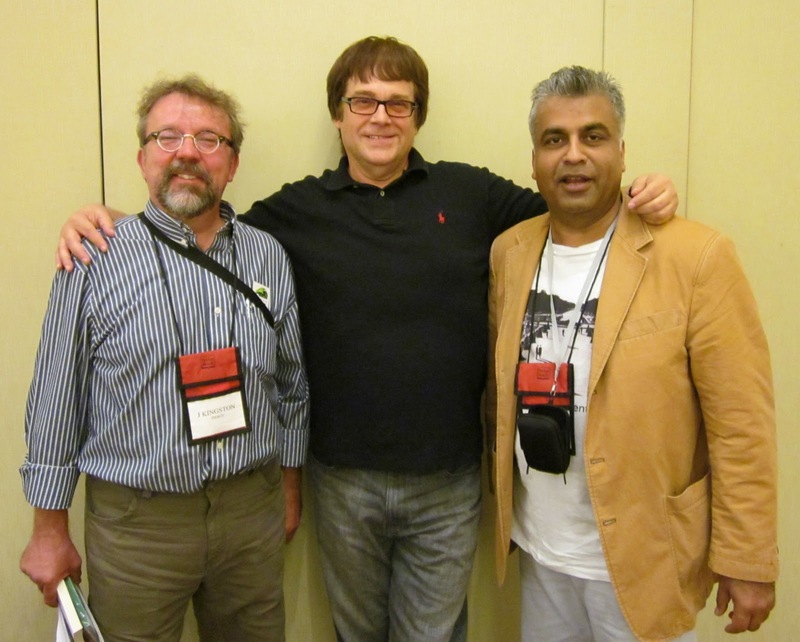 From the left: The Rap Sheet’s J. Kingston Pierce, Shots editor Mike Stotter, editor and bookstore proprietor Otto Penzler, and Deadly Pleasures reviewer Larry Gandle. 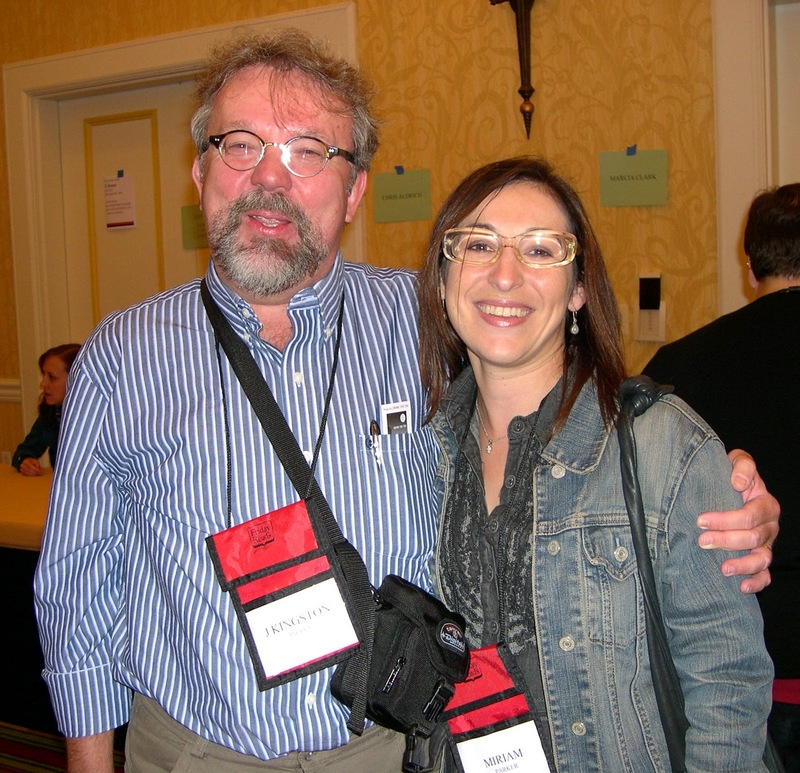 Most of the 1,600 visitors to Bouchercon 2011, which was held September 15-19 in St. Louis, Missouri, attended that event in search of fans and/or old friends, and hoped to spread their names about a bit more, maybe sell or buy some books. But I was there for another reason as well: to learn about my great-grandparents, a subject I’ll address in due course. For a long while, I resisted registering for last month’s convention. After participating in a couple of treasured Bouchercons in quick succession (Baltimore in 2008, and then San Francisco in 2010), I thought maybe it was a good idea to wait for a few more years before trying another. I figured that the 2014 event in Long Beach, California (which will follow gatherings in Cleveland, Ohio, and Albany, New York) would offer a more interesting setting, and it will certainly be closer to where I live. However, when two of my British colleagues--Rap Sheet contributor and ubiquitous reviewer Ali Karim, and novelist Roger “R.J.” Ellory--announced they were traveling to St. Louis for this occasion, and would be joined there by Mike Stotter, editor of the e-zine Shots (who I first met during a very drunken book launch some years ago in London)--my resistance crumbled. It’s not often enough that I get to England, so seeing such compatriots on this side of the Atlantic Ocean is a treat that I did not want to miss. Furthermore, The Rap Sheet and I had been nominated for an Anthony Award--for a second time, after Baltimore--and it’s hard to pass up the opportunity to be on hand to be handed a prize of any sort. Not that I expected to win--and I didn’t, in the end, one of my few disappointments during this trip. • Sharing mini-burgers with legendary editor Otto Penzler at the St. Martin’s Minotaur party, while he encouraged me--at entertaining length--to pick up a copy of his latest doorstopper of a short-story collection, The Big Book of Adventure Stories (2011). • Chatting at the William Morrow party with Chelsea Cain (The Night Season), whose sparkling personality and light humor are much in contrast with her dark thriller fiction. • Finally meeting editor-writer Bryon Quartermous, who told me that he’s called off plans to resurrect his once-popular Webzine, Demolition. There are just too many competing and successful products already available on the ’Net, he explained, and a call for submissions to the first edition of the revitalized Demolition proved disappointing. Bryon said, though, that he hasn’t given up on the notion of rebuilding his e-zine--he’ll watch for a better opportunity sometime in the near future. • Frequenting the giant book-sales room in the Renaissance Grand Ballrooms building (adjacent to the convention hotel), where I picked up a few gems from a booth representing Hooked on Books, a Web-based “store”--originating from Illinois--that specializes in vintage and collectible paperbacks. I paid daily visits to that booth, familiarizing myself with its stock of plastic-wrapped volumes. I wound up buying novels by authors I’d not previously read (including Helen McCloy and Bill S. Ballinger), as well as a few that I simply had to have because of the quality of their cover illustrations. 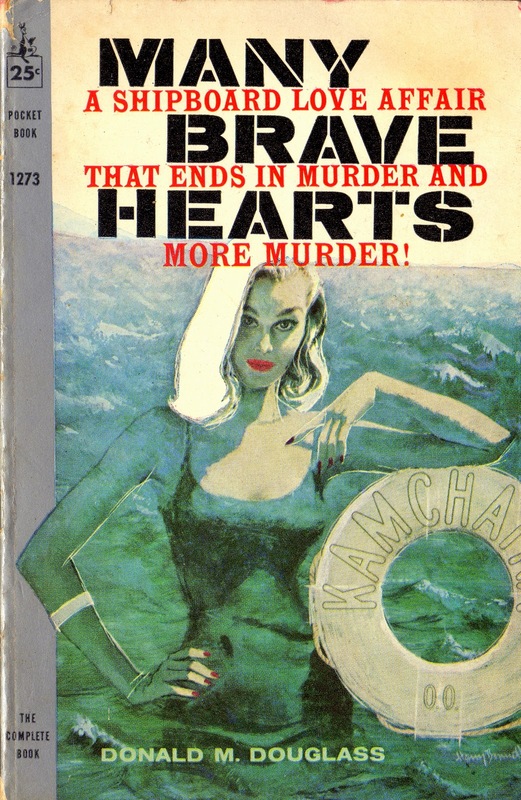 An example of the latter can be enjoyed on the left: Donald M. Douglass’ Many Brave Hearts, a 1960 Pocket Books edition with jacket art by Harry Bennett. • Sharing a meal with Janet Rudolph, editor of the Mystery Readers Journal, who also blogs at Mystery Fanfare. I’ve often seen Janet at these get-togethers, but had never before had the chance to speak with her at length. She turned out to be a delightful dinner companion. • Introductory encounters with Denise Hamilton (Damage Control), Chris Ewan (The Good Thief’s Guide to Venice), Keith Thomson (Twice a Spy), Adrian Magson (Death on the Rive Nord), Deon Meyer (Trackers), Sean Doolittle (Safer), Jonathan Hayes (A Hard Death), and Sara Paretsky (Body Work). I also enjoyed renewing my acquaintance with Gary Phillips, Max Allan Collins, Patti Abbott, Megan Abbott, Martyn Waites, Peter Rozovsky, Kelli Stanley, Les Blatt, Con Lehane, Dana Cameron, Craig McDonald, and Barbara Fister. Bouchercons are very much about comradeship. 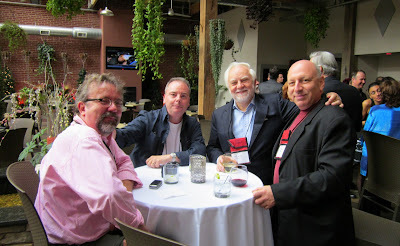 It’s rare that most of us get to hang around with so many people who share our passion for crime fiction. • Smoking cigars with Anthony Rainone. Anthony has long been a contributor to January Magazine, which I also edit, and writes infrequently for The Rap Sheet. On the Saturday of this last Bouchercon, I strolled down to the Starbucks nearest the convention hotel, the Renaissance St. Louis Grand, and took my place, reluctantly, at the end of a conga line of patrons that stretched from the serving counter all the way to the front door ... and then back again to the counter. And who should I find myself standing immediately behind, but Anthony. He’d just arrived in St. Louis the night before, and had a few obligations, but we swapped cell phone numbers and arranged to meet later. Finally, at about 9 p.m. the two of us dropped in at Stanley’s Lounge, a cigar bar on Washington Street, just a few short blocks from the Renaissance. That smoke-filled joint boasted a walk-in humidor--with attendant, no less. Anthony and I each picked out our favorite brands, found places at the big square bar, ordered drinks, and proceeded to talk for hours about books, our experiences in St. Louis, and the difficulties of trying to read--much less review--the myriad crime novels being produced nowadays. • Attending the “Shadows Rising” panel discussion, during which moderator Jeremy Lynch of Crimespree Magazine and his five panelists--Megan Abbott, David Corbett, Russel D. McLean, Todd Ritter, and Wallace Stroby--identified their favorite noir movies from the 20th century. Not only familiar flicks such as Fritz Lang’s M (1931), Double Indemnity (1944), In a Lonely Place (1950), and Kiss Me Deadly (1955), but also such obscure cinematic fare as Il bidone (1955). Between that discussion and the panelists’ follow-up posting in the Crimespree blog, I now have a ludicrously long Netflix list of what to watch next. • Encountering Miriam Parker (right), the effervescent marketing director from the Mulholland Books division of Little, Brown. I would have written that I “met” her, except that “met” suggests something rather less boisterous than the truth. You see, I was walking through the convention’s book-sales room with Max Allan Collins, who’d just promised to introduce me to his sometime writing partner, Matthew V. Clemons, when we passed a pair of fetching, dark-haired young women, one of whom glanced at my name badge, suddenly reached for my arm, and announced that she was my “number-one fan.” Now, I’ve never been known to have a fan, much less a number-one fan, so I think my dumbfoundedness under these circumstances was quite understandable. I managed to carry on and meet Clemons, but was soon back talking with Miriam. She proved to be a fund of reading suggestions (including only a couple of books she represented), and in turn introduced me to Mulholland editor John Schoenfelder. This is one of the treats of any Bouchercon: happening on people you know by name and reputation, but who might previously have passed you on the sidewalk entirely unacknowledged. • Sitting with D.E. “Dan” Johnson (Motor City Shakedown) at the Librarian Breakfast, and then with Thomas Kaufman (Steal the Show) at Friday’s Shamus Awards banquet. • Hanging out in the convention hotel’s bar with Ali, Roger, Mike Stotter, and whoever else stumbled by. 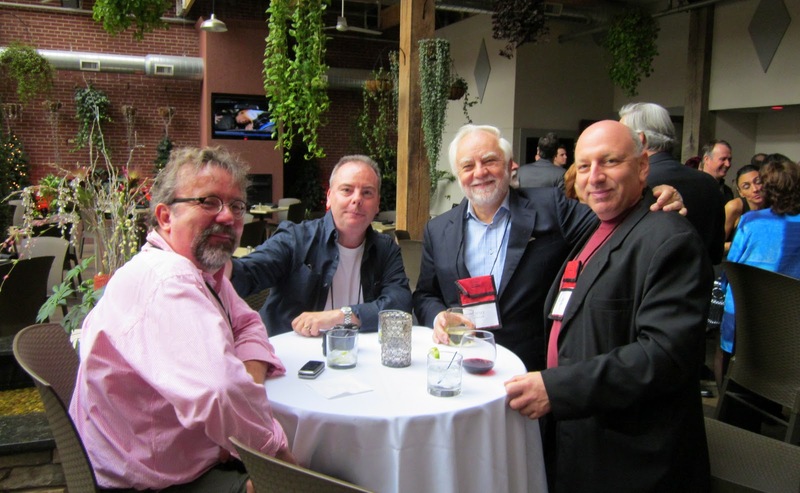 A good watering hole is essential at Bouchercon, because it’s there that interpersonal links are most easily made and the best strange convention stories shared. • And visiting my great-grandparents’ house. Prior to Bouchercon, I’d never been to St. Louis. However, my father was born there. His beloved grandfather, my great-grandfather, had been an executive with the N.O. 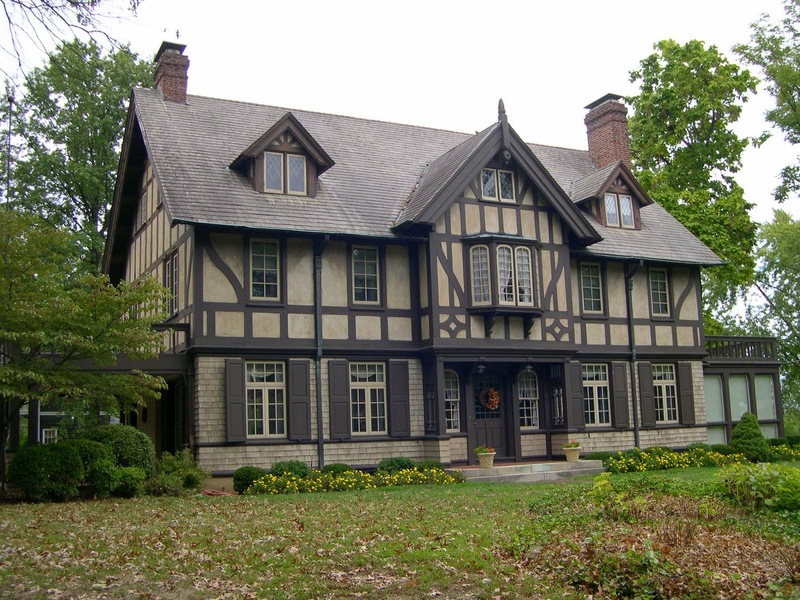 Nelson Manufacturing Company, a major national distributor of plumbing supplies during the early 20th century, and had constructed for himself and his wife a stately Tudor-style home in Webster Groves, an affluent St. Louis suburb. That house (shown here) went up in 1909 and was designed by the local architectural firm Jamieson and Spearl, which also created the majority of edifices at Washington University at St. Louis and the University of Missouri between 1912 and 1950. For most of my life, the only association I had with my great-grandparents’ residence was through a couple of dusty black-and-white photos. But before setting off for St. Louis, I contacted the Webster Groves Historical Society, looking for information about that house and who lived there now. The people at the Society were very helpful in connecting me with the current occupants. So while I was in the city, I took a few hours off from the convention, hired a cab, and went out to Webster Groves. The folks who now live in my great-grandparents’ home, both in their 80s, couldn’t have been friendlier or more welcoming. They showed me around the place (which they have restored to its vintage splendor), brought out a couple of photos of my great-grandparents that I’d not seen before, and even had stories to tell me about my paternal ancestors. For as it happens, the woman who lives in that large house also grew up nearby, and she and her sister were quite friendly with my great-grandmother (who managed to outlive my great-grandfather by some two decades). I know my father and his grandfather were very close, but I think I heard more about my great-grandparents from the people who live in their old home than I ever did from my less-garrulous father. Although Bouchercon was the focus of my St. Louis journey, this side-trip to Webster Groves and the opportunity to hear about my family’s history was certainly the most memorable aspect of the adventure. 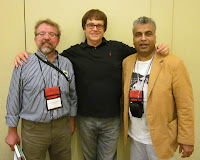 POSTSCRIPT: I would be remiss if I did not credit organizers Jon and Ruth Jordan, co-editors of Crimespree Magazine, and McKenna Jordan, the owner of Houston’s Murder by the Book, for their joint efforts in making the St. Louis Bouchercon such a success. I was a real pleasure meeting you again. That photo of the old family home is a treasure. Might even see you again in Cleveland next year - who knows? Terrific indeed, in fact my Bouchercon was made meeting friends and enjoying your company - we did have a really funny time, something that is important when faced with the anxieties that form modern life - great to re-live those days and nights in St Louis! Such a terrific post for those of us that couldn't make it. Thanks. Good post, Jeff. I want to attend some of the book conventions going on someday. So glad you found your great-grandfather's house and met the owners since they knew your family. I knew I'd regret not going this year! Sounds like it was a blast. I'll try to arrange my schedule better so I can attend next year.